Overtaking a Cat, with our full crew of 3 families. 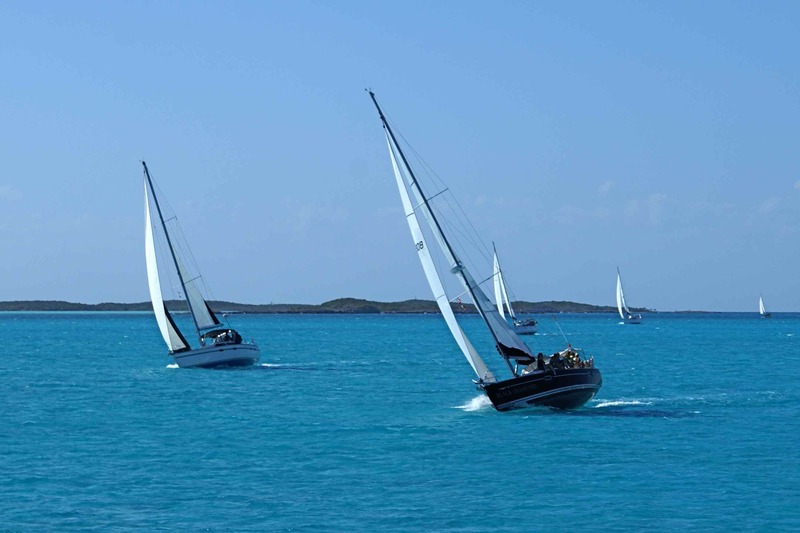 The island hosts their annual Cruisers regatta on New Years Day, January 1st, 2009. What a way to start the new year! I can only hope that this year continues with many more enjoyable races like this one. 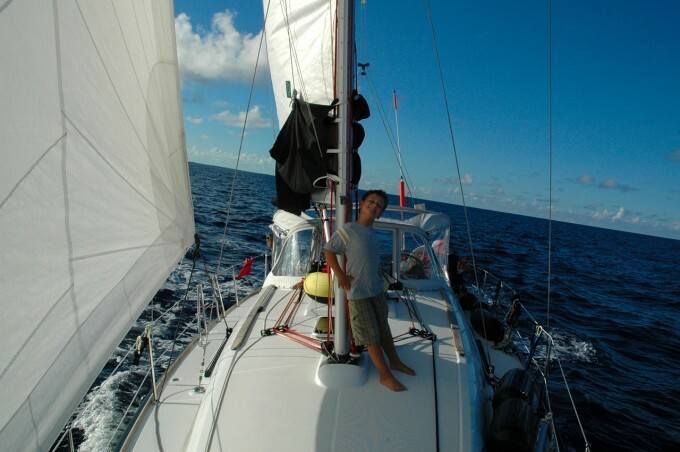 Of all the 100+ days of sailing in 2008, this was probably my favourite! The boat performed amazingly, and I was able to enjoy this day with my whole family and some new friends. The Commodore presents us with the 2nd place trophy for the regatta. 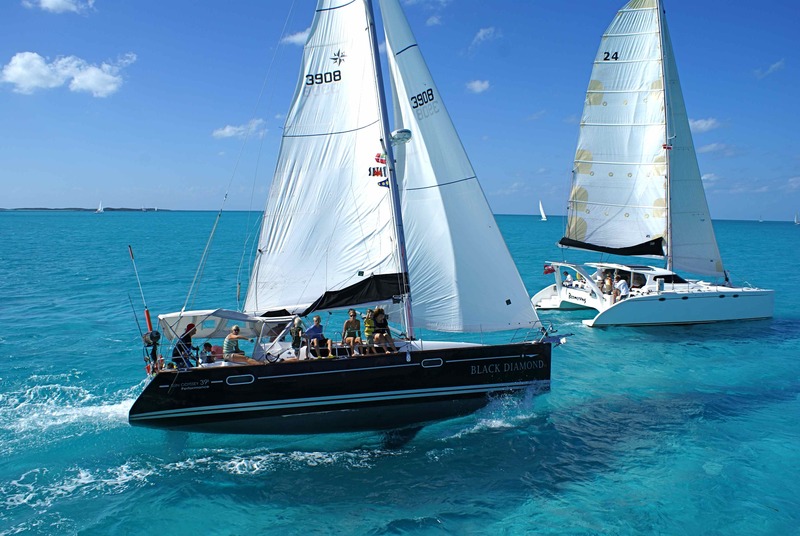 I believe 17 boats entered the race, including a few Catamarans. It was a down wind start to make it fair for the variously rated boats. The pre-start was just as exciting as the race it self, we used this time for the new crew to get familiar with the ropes. The waters we raced in were shallow, about 8 to 12 feet deep, our boat draws 6 feet 6 inches, so I was a little nervous. but the race committee guaranteed that we would be fine on the entire race course. The race committee messed up the start a little, with the canon firing about 30 seconds late, and we thought we may be over the line early, so we held back at the start until we heard the cannon. Close hauling and pulling away from the fleet. So basically we started a little late from the lead boats. But we quickly caught up. There was some stiff competition. Our greatest competition came from “Different Drummer” a 47 foot semi-race boat, with a crew of over 12 people, many on the rail. The boat had a retractable keel, so they could adjust it for the depth of the water, and with it fully extracted I believe it was 9 feet deep. It sailed very well close hauled to the wind. Before you knew it Black Diamond took the lead, and “Different Drummer” was just a little nervous. They have entered this race 7 times, and they were gunning to win. We exchanged lead position a couple of times. We made a few mistakes, we were over powered by the main a few times, and were forced to tack prematurely. We made a couple of tactical errors as well. But still gave “Different Drummer” a run for their money. In the end they only beat us by about 3 minutes, their time was 1 hour 31 minutes, many other boats took closer to 2 hours to finish. 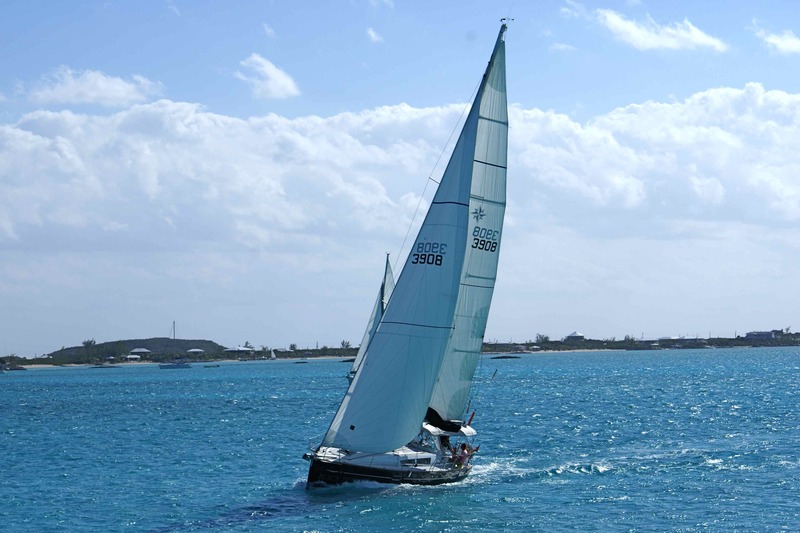 The 3rd place boat was Wind Swept IV, a 40 foot C&C if I am not mistaken. They were about 6 minutes behind us. 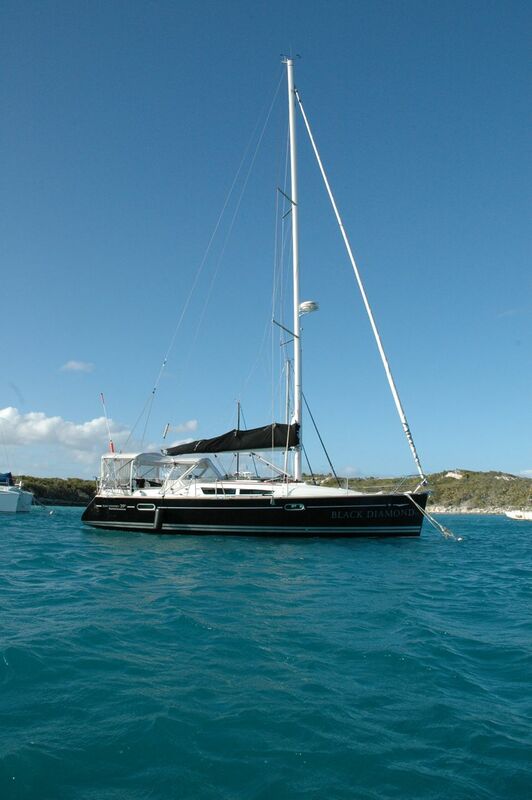 We even beat a 40 foot catamaran. They are usually much faster especially down wind. But, I just refused to let him pass me. Every time he tried, we just kept taking him up wind, and thy can’t sail as close to the wind as us. Not bad for a crew of family cruisers that just met the day before. 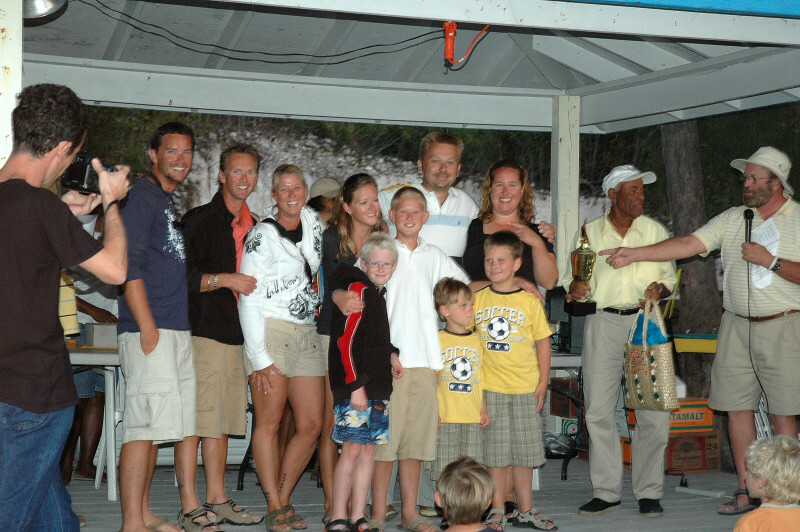 Later that evening, we attended the awards ceremony out by the beach and had a Bahamian dinner with the other racers. The race committee and the islands locals were so generous and also included a hand made gift bag, paintings, home baked banana loaf, and other prizes. Everyone on the rail, close hauling once again. Duane and Kim the newly weds never even raced before. Below is an account of the race by Duane. 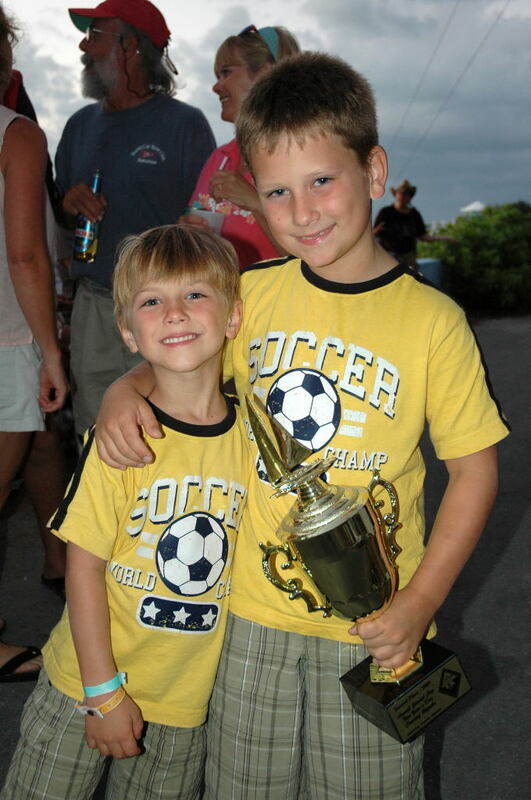 Thomas was the strategist for the race, they both loved it. A beautiful New Years Day for a Regatta, perfect conditions! Black Diamond in Full Sail beam reaching.